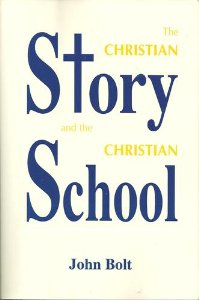 A great read for anyone looking for a primer on reformed and Christian education. Best of all, from my perspective, Dr. Bolt takes seriously the insights and contributions of the ethical theologians (Hauwerwas, et al) who insist that ethics are formed in a community of character.Having said that, I was disappointed that this book lost momentum in the final eponymous chapter. I had hoped that Bolt would tie earlier chapters together up in a nice package and send me home with a way forward in terms of curriculum and steps toward creating a "community of character" in a Christian school. I guess another book needs to be written for that. Does anyone have a suggestion? John Bolt - John Bolt (PhD, University of St. Michael's College) is professor of systematic theology at Calvin Theological Seminary in Grand Rapids, Michigan, where he has taught for more than twenty years.